Sphere International Freight (Pvt) Limited is a dynamic and responsive freight forwarding service provider; well established in the industry. We pride ourselves on being dynamic and innovative in our approach to operations and to our business management processes. Managed by personnel with decades of experience in the freight forwarding field, Sphere International Freight (Pvt) Limited strives to deliver service quality that matches international standards. We excel at providing speedy, efficient and accurate services that are optimized to meet client requirements. Our team is dedicated to understanding the client's business and developing solutions that best suit the customer's needs. Pls.visit: http://gca-family.com/member-directory/341-sphere-international-freight-pvt-ltd / http://www.spherefreight.com for more information. We offer a wide variety of services tailored to our customers′ needs, including air and ocean consolidation, FCL/LCL, trucking, customs brokerage, and warehousing services. Our well-trained and experienced operation teams, along with the most state-of-the-art track and trace system, allow us to surpass our customer's expectations. Isnad International Freight Forwarding has an extensive network around the world to sustain imports and exports. The staff in Isnad International Freight Forwarding are dedicated professionals who will evaluate and offer the best delivery options to our customers. We are the best shipping air-sea cargo freight forwarders. We are the best & reliable resources for road, sea, and air transportation logistics services. We specialized in Singapore import and export, Loading and Unloading service, Stock WareHouse. Pls.visit: http://gca-family.com/member-directory/340-isnad-international-freight-forwarding / www.isnadinternational.com for more information. The ITC is an internationally renowned apex chamber of commerce, providing services to chambers, business associations, export councils, government trade agencies and businesses alike. 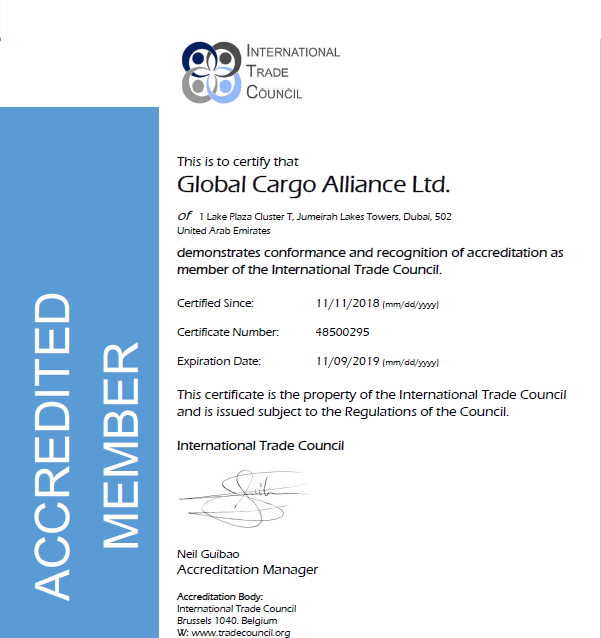 International Trade Council members are reputable businesses and individuals, operating in over 76 countries worldwide. In addition to its own member-base, the Council works with a wide variety of external groups to maximize areas of common ground and minimize differences. The Council also works closely with policy-makers to sponsor the creation of additional networks, forums, and alliances which can provide a focus for collaborative work and new growth opportunities. This also helps to provide a consolidated industry overview and helps participants develop new skills. Cantrans Logistics is an Organisation Offering a Wide range of services in the field of international freight forwarding transportation, customs clearing, and other shipping services, since 2000. Our services include forwarding To & Form all major seaports with door to door packages and Air freight To & Form all major deliver all major airports including door deliveries, Overland transportation to & form all the Indian destinations. We have the team of highly qualified, technically experienced and dedicated staff to handle various service divisions having International Networks and associates at Worldwide. Cantrans Logistics dedication to value-added quality services. Combined with professional customer focus has earned credibility because of the reliability we provide to the customer. Pls. visit http://gca-family.com/member-directory/339-cantrans-logistics-pvt-ltd / http://www.cantranlogistics.com for more information.